Wednesday, June 1 @ 9:30-10:00 a.m.: Book Babies lapsit program for ages infant to 24 months with caregiver. Join Mrs. Davis for rhymes, songs, story and playtime. No registration required. Thursday, June 2 @ 11:00-11:30 a.m.: Book Babies lapsit program for ages infant to 24 months with caregiver. Join Mrs. Davis for rhymes, songs, story and playtime. No registration required. Friday, June 3 @ 10:30 -11:30 a.m.: STEM with Miss Nicole. Week 6. Geared towards ages 3-5. This literacy based play group teaches children about Science, Technology, Engineering and Math. Sponsored by Triumph, Inc. Call Nicole to register at 508-822-5388 ext. 201. 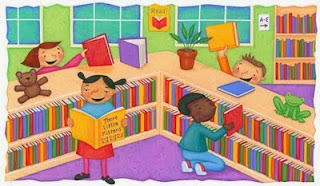 Tuesday, June 7 @ 1:00-1:30 p.m.: Drop in for an exciting story time with Miss Emily. Ages 3+ with adult. No registration required. Wednesday, June 8 @ 9:30-10:00 a.m.: Book Babies lapsit program for ages infant to 24 months with caregiver. Join Mrs. Davis for rhymes, songs, story and playtime. No registration required. This informative workshop will address the nutrition questions and concerns common to student athletes, busy parents, and health-conscious people who want more energy (and perhaps less body fat). 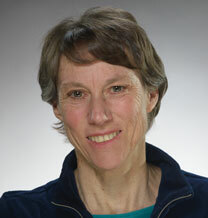 Sports dietitian Nancy Clark MS RD will help resolve your confusion about what, when and how to eat for performance and good health. 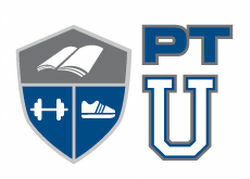 Topics will include: Sports Nutrition: What should I eat before, during and after l exercise? What about sports drinks, gels, and electrolytes? How can I tell if I am well-hydrated and have had enough to drink? Weight reduction: How can I lose weight and still have energy to train well? Am I the only one who has ever gained weight while training for a sport? Are carbohydrates fattening? What should I eat to burn more fat? Health: Should I be taking extra vitamins? How can I get rid of my addiction to sugar? How can I be a student and an athlete — and still manage to eat well? Please come with your questions, so you can leave with the answers you need to help you fuel well, have better energy and thereby better enjoy sports and life with good health and high energy. 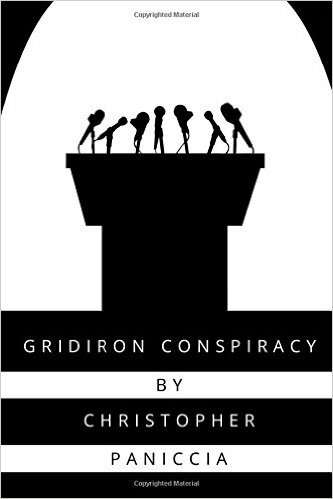 Local Author Christopher Paniccia to Speak at Bridgewater Public Library on June 7th @ 6:30 p.m. to discuss his book “Gridiron Conspiracy”. Gridiron Conspiracy is a book for all tastes. It delves into the world of sports related drama with everyday aspects of suspense, thrilling action, and science fiction. Whether you enjoy the drama of real life situations or the imagined world of science fiction, Gridiron Conspiracy is for you. Come join Chris Strong in his relentless pursuit to become a professional football player while finding out the world he thought was real is nothing more than a smoke screen. Find out how Chris and company go up against a corporate giant in order to find the truth, but yet find the truth not what they thought it would be. This book contains twists and turns around every corner. You will find yourself not able to put this book down. In the end your mouth will be left open wondering how you could have not seen the end coming. Hailing from Rhode Island, author Christopher Paniccia attended Bridgewater State University where he earned both his B.F.A and M.A.T. in Fine Arts. Christopher has spent over twenty years teaching in the Elementary and College classrooms. He is constantly striving to let his students know they can do anything. Gridiron Conspiracy captures the minds of those who wish to see themselves dream and see those dreams become a reality. The Bridgewater Garden Club will hold the last meeting of the season on Monday, May 23, at 6:30 PM at the Cole-Yeaton Senior Center, Wally Kruger Way, Bridgewater. The speaker for the evening will be Mike Paduch of Crystal Lake Garden Center in Carver. He will be speaking about new plant combinations for the container or gardens. The evening will also include the installation of new officers for both day and evening groups. A Pot Luck supper by the members will be served. Friday, May 20 @ 10:30 -11:30 a.m.: STEM with Miss Nicole Week 4. 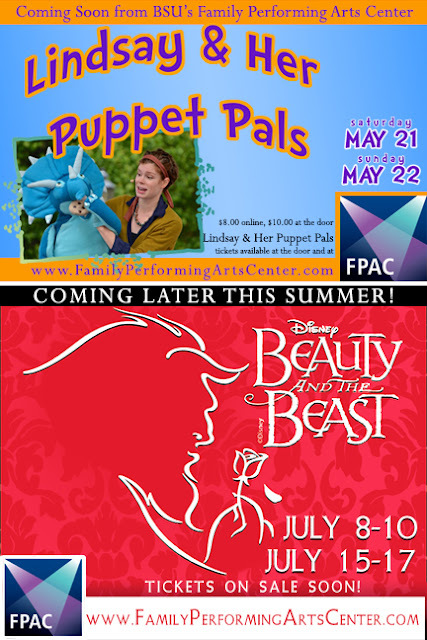 Geared towards ages 3-5. This literacy based play group teaches children about Science, Technology, Engineering and Math. Sponsored by Triumph, Inc. Call Nicole to register at 508-822-5388 ext. 201. Saturday, May 21 @ 10:30-11:30 a.m.: Read to a dog. Come read to Jasper, a registered therapy dog. Jasper loves to be read to or told stories to. Show him a book, sit down, and share a book with this friendly dog. No registration, all ages. Tuesday, May 24 @ 1:00 p.m.: Kids and their caregivers are invited to join us and color using Mindfulness Coloring. Ages 3+. No registration required. Wednesday, May 25 @ 1:00-2:30 p.m.: Movie! This movie rated PG about a certain sheep who takes the day off and finds all kinds of trouble. All ages welcome for this movie with adult. No registration. 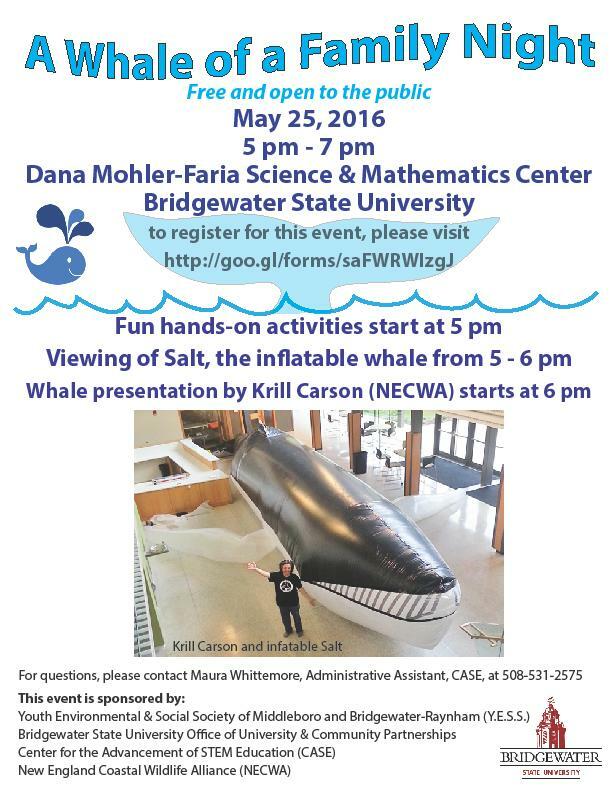 Friday, May 27@ 10:30 -11:30 a.m.: STEM with Miss Nicole. Week 5. Geared towards ages 3-5. This literacy based play group teaches children about Science, Technology, Engineering and Math. Sponsored by Triumph, Inc. Call Nicole to register at 508-822-5388 ext. 201. Monday, May 30: Closed for Memorial Day. The Center for the Advancement of STEM Education at Bridgewater State University is offering its annual Summer Science Academy of week long programs for middle and high school students throughout the month of July. Programs offered for middle school students include: xSTREAM Adventures, Forensics Institute of Bridgewater and Whale of a Mystery. High school students will have options for Biotech Career Rotations I: Real-world techniques to answer real-world problems; So you want to be what? Exploring careers in medical sciences; and Biotech Career Rotations II: Real-world techniques to answer real-world problems. Three sessions will be offered – July 11-15, July 18-22 and July 25-29. The program fee of $400 a week is for students entering grades 6 to 8, while students entering grades 9 to12 will be assessed a program fee of $490 per week. The fee, which covers all course expenses including lab supplies and materials, does not include lunch or transportation. A limited number of needs-based scholarships are also available. The middle school academy will be offered daily from 8:30 a.m. to 4 p.m., with afternoons encompassing extracurricular activities and final presentations. The high school sessions will run Monday to Thursday from 9 a.m. to 4:30 p.m. and on Friday from 9 a.m. to 3 p.m. The American Red Cross encourages all eligible blood donors to give blood during the month of May to honor those who have served our country and in memory of loved ones. In the summer season, blood donations usually slow down and supplies are at the lowest, but patients don’t get a holiday from needing blood. Please consider giving blood this month to honor our heroes and help give the Gift of Life. 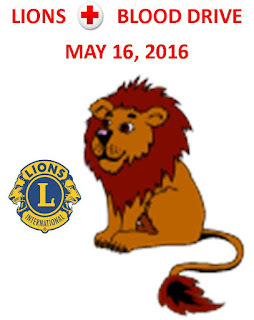 Bridgewater Academy Lions Club is sponsoring a blood drive on Monday, May 16th from 2 p.m. to 7 p.m. at the Conant Community Health Center, 5 Wally Krueger Way, off Rt. 18, Bridgewater. Walk-ins are welcomed, but to reduce wait times, appointments are encouraged. To make an appointment to donate blood, please visit redcrossblood.org or call 1-800-RED CROSS (1-800-723-2757). The Bridgewater-Raynham Special Education Parents Advisory Council (BR-SEPAC) will be holding a presentation for the 2015-2016 school year on Tuesday, May 31st at 6:00 pm titled, Easter Seals. Chris Wiklund will discuss the wide range of services Easter Seals provides. Services such as transition services, direct coaching, assistive technology consultations, and assessments. He will also cover employment training, coaching services, and Easter Seals generous loan program. The university and the Paula Shea Children’s Endowment announced today that they have joined in a formal, dollar-for-dollar matching agreement that will allow their partnership to reach a wider number of preschool, elementary and middle school children in Bridgewater. Bridgewater State and the Paula Shea Children’s Endowment have collaborated on children’s literacy programming for several years, but the formal agreement will allow them to expand their joint efforts. The formal agreement was signed by BSU PresidentFrederick Clark Jr., Esq. and Mary Ellen Shea, daughter of the late Paula Shea. The mission of the Paula Shea Children’s Endowment is to support and enhance preschool through grade six programs designed to stimulate a love of literacy and learning for the children of Bridgewater. Under the direction of Susan McCombe of BSU’s Office of University and Community Partnerships, Bridgewater State and the Shea Endowment have partnered on numerous programs to enhance educational opportunities for Bridgewater school children, including several applied learning experiences in the fields of astronomy, math, engineering and conservation. “Scrabble for Adults!” at the Bridgewater Public Library on May 31st @ 6:30 p.m. The Bridgewater Public Library is offering their first drop-in session of Scrabble for Adults. All games, score sheets and dictionaries are provided. No registration required and all ability levels are welcome. Reduce your risk of developing Alzheimer’s disease and dementia by playing Scrabble. There are a lot of benefits to playing besides being fun it is rewarding mentally, socially and emotionally. The Gravestone Girls present a virtual tour of Bridgewater Cemeteries on May 24th @ 6:00 p.m. Cemetery educators, The Gravestone Girls, whose mission is to “Keep Our Dead Alive”, will be presenting a virtual tour, called “Welcome to the Graveyard”, centered on Bridgewater’s 18 local cemeteries. The 90 minute presentation is built on photographs recently taken in these special and interesting burying places around Bridgewater, which was established in 1656, and charts the evolution of cemeteries and gravestones from the colonial era into the 21st century. 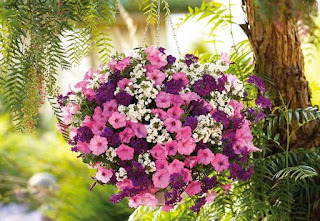 Bridgewater Troop 31 will be at the Transfer Station on Saturday 7 a.m. to 2 p.m. and Sunday 9 a.m. to 12 p.m. selling beautiful hanging baskets from Spillane's Nursery of Middleboro. They will be sold for $25.00 and 50% of the proceeds comes back to the Troop. Come out and see the NEW Transfer Station sign that the newest Eagle put up and pick up some flowers for Mom, Grams or yourself. Cash and credit cards are accepted. Troop 31 thanks you in advance for your support. 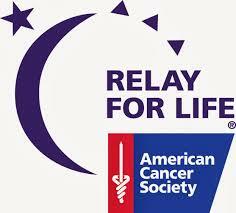 The American Cancer Society Relay For Life of Greater Bridgewater is just over a month away! The next Team Captain’s meeting will be held on Monday, May 5, at 7pm. This will be held at St. Basil’s Catholic Center on the Bridgewater State University campus (122 Park Avenue). Campsites for the event will be chosen. Site selection is based on a first come, first served basis. This year’s Relay For Life of Greater Bridgewater takes place on Friday, June 10, at 3pm, at Bridgewater Raynham Regional High School. The overnight fundraiser is held with the goal of keeping at least one team member on the track at all times throughout the evening. Teams do most of their fundraising prior to the event, but some teams also hold creative fundraisers at their camp sites during Relay. Relay brings together friends, families, businesses, hospitals, schools, faith-based groups . . . people from all walks of life – all aimed at celebrating the lives of those who have had cancer, remembering those lost, and fighting back against the disease. If you would like to join the Relay For Life of Greater Bridgewater as a volunteer or team participant, visit RelayForLife.org or email Monica Querzoli at maquerzoli@comcast.net. Dog owners in Bridgewater are reminded that due to the most recent amendment to the Canine Control Enforcement Ordinance, the Dog Licensing Period has changed from a Fiscal Year to a Calendar Year. Licenses now run from January 1st through December 31st. Thus, licenses for dogs registered in 2015 have been extended through December 31, 2016. Renewals will begin on January 1, 2017. All dogs living in Bridgewater should have red, stop-sign-shaped 2015 dog tags. Residents are welcome to contact the Town Clerk’s Office (508-697-0921) to verify their dogs’ licenses or to ask other questions. Licenses may be purchased in person at the Town Clerk’s Office, currently located at 64 Central Square in the Town Hall but which will be relocated to 66 Central Square (the Academy Building) by November. Office hours are Monday through Thursday 8 a.m. to 4 p.m., Friday 8 a.m. to 1 p.m. Licenses also may be purchased by mailing a request, the proper fee, self-addressed stamped envelope and copy of current rabies certificate to Town Clerk’s Office, 64 (or 66 after the move) Central Square, Bridgewater, MA 02324. 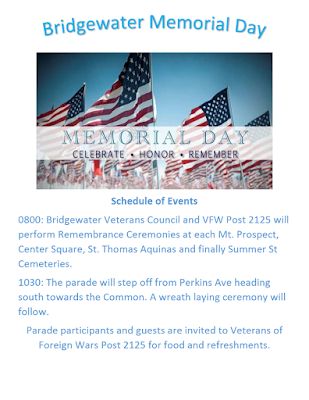 Additionally, licenses may be purchased online through the Town’s Website: www.bridgewaterma.org under QUICK LINKS then ONLINE PAYMENT CENTER. Tuesday, May 10 @ 1:00-1:30 p.m.: Drop in for an exciting story time with Miss Emily. Ages 3+ with adult. No registration required. Wednesday, May 11 @ 9:30-10:00 a.m.: Book Babies lapsit program for ages infant to 24 months with caregiver. Join Mrs. Davis for rhymes, songs, story and playtime. No registration required. Wednesday, May 11 @ 11:00-11:30 a.m.: Drop-in Story for all ages children must be accompanied by an adult. Join Mrs. Davis for rhymes, songs, and stories based on a weekly theme. No registration required. Thursday, May 12 @ 11:00-11:30 a.m.: Book Babies lapsit program for ages infant to 24 months with caregiver. Join Mrs. Davis for rhymes, songs, story and playtime. No registration required. Friday, May 13 @ 10:30 -11:30 a.m.: STEM with Miss Nicole. Week 3. Geared towards ages 3-5. This literacy based play group teaches children about Science, Technology, Engineering and Math. Sponsored by Triumph, Inc. Call Nicole to register at 508-822-5388 ext. 201. All types of metal will be gratefully accepted, including stoves, pipe, filing cabinets, bikes, shelving, and grills. Items containing Freon, gas, propane, glass, and appliances such as refrigerators, freezers, air conditioners, propane tanks, TVs, safes, chain link fence, or containers that have contained chemicals or paint CANNOT be accepted. Friendly volunteers will be on hand to unload your metal. 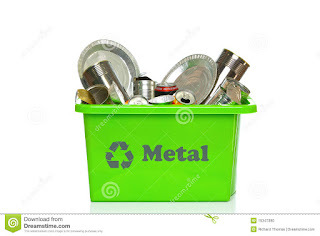 The metal recycling drive will be held rain or shine and is open to anyone. The metal drive is sponsored by the church's Green Sanctuary Committee, in conjunction with Bridgewater Recycling, Inc. Green Sanctuary churches are committed to promoting sustainable lifestyles for their members and their community. A portion of the profits will be donated to the Bridgewater Food Pantry. 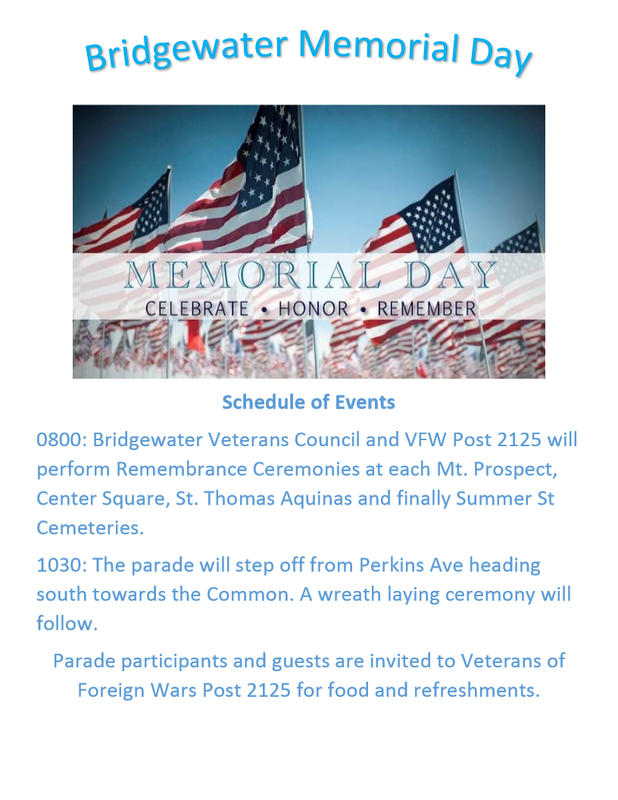 For more information, visit the church website at www.firstparishbridgewater.org, or visit ourFacebook event page. 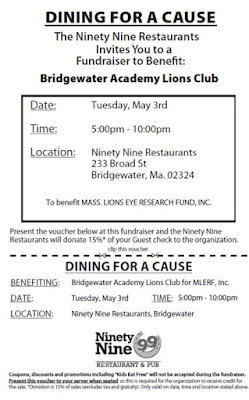 Bridgewater Academy Lions Club invites you to attend their 'DINING FOR A CAUSE" fundraiser for MASS. LIONS EYE RESEARCH FUND, INC on Tuesday evening, May 3, 2016 from 5 PM-10 PM at the 99 RESTAURANT, Campus Plaza, Bridgewater. If you present a copy of the attached voucher when ordering during the event, the restaurant will donate 15% of your guest check (excluding tax and gratuity) to Mass. Lions Eye Research Fund, Inc. This voucher is valid for either DINE-IN or TAKE-OUT orders at the BRIDGEWATER 99 ONLY. Print out a copy of this voucher yourself or pick up printed vouchers at the Bridgewater Town Hall, Senior Center, Public Library, Polished Image Hair Salon, and from any Bridgewater Academy Lion member. They also will have drawings for prizes in the restaurant foyer, with ticket proceeds to benefit local scholarships, community programs, and other Bridgewater Academy Lions charities. It's time to mark your calendar once again for the 14th Annual Bridgewater Savings Charitable Foundation Golf Classic. It's always a great tournament for a great cause! Last year, Bridgewater Savings raised over $25,000 for local charities. 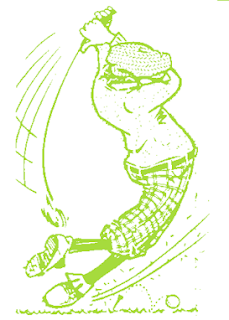 This year's event will be held on Monday, June 13th at LeBaron Hills Country Club in Lakeville, Massachusetts. 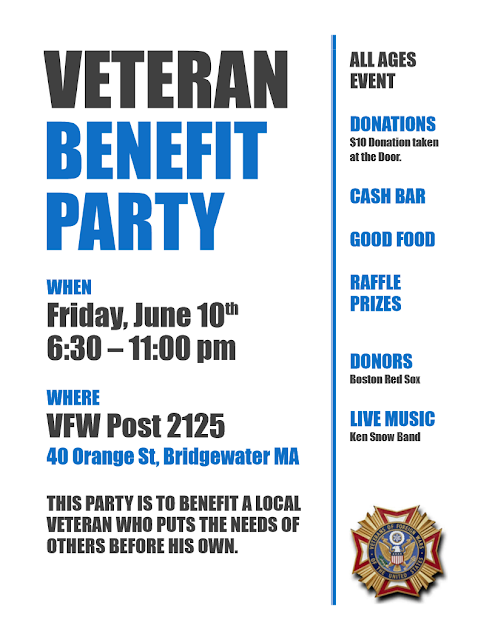 For event details including sponsorship, please contact Kathleen Lynch at 508-884-3311 or email Kathleen by clicking here. The Bridgewater Badgers Youth Football Program will conduct registrations on May 7th from 8-9AM at the football concession stand at Legion Field. Registration will be accepted on a first-come, first-serve basis. There are teams for children between the ages of 7 and 14. The fee is $175 per player and $300 per family. The Mighty Mites program is $150. For more information, please check out the program's website or email Tim Nixon by clicking here.